Egg Pawns are perhaps the most quantitatively numerous Eggman robot ever mass-produced. The ubiquitous workforce of the Eggman Empire for games from Sonic Heroes to Sonic Forces, Egg Pawns take design inspiration from the humanoid E-100 Series of Sonic Adventure and the Eggrobos of Sonic & Knuckles. As is often the case with Dr. Eggman's creations, the robots play into the fat scientist's ego-trip by populating his dominion with machines built in his own image. Egg Pawns are typically red/orange in colour, with short, metallic limbs and a permanent toothy grin built into their faces. Unlike early badniks, the Pawns do not have weapons built into their chassis, instead having to arm themselves with spears or guns or bazookas to engage in combat - a feature which becomes important to gameplay in Shadow the Hedgehog, where dropped munitions can be used by the player. Contrary to the cold, robotic implacability of such Eggman creations as Metal Sonic or Chaos Gamma, Egg Pawns are usually portrayed as skittish and cowardly, with whole armies of them fleeing from large threats (like Metal Madness in Sonic Heroes). In Casino Park and Bingo Highway in Sonic Heroes, Eggman had seemingly redesigned some Egg Pawns to fit his casino theme; the Casino Pawn. The robots came in croupier, butler, neon-mohawk, and (oddly) bunny-suit flavours. These casino designs appeared as collectible cards in Sonic Rivals 2, except for the butler model. In the 3D games where they feature (Sonic Heroes, Shadow the Hedgehog, Sonic Generations and Sonic Forces), Egg Pawns lack any explicitly specified power source, but in Sonic Rush animals pop out when they are defeated. Just as the Pawns superseded earlier models like the Eggrobo, they have in turn been intermittantly succeeded in Eggman's schemes as the Fat Man's science marches on. 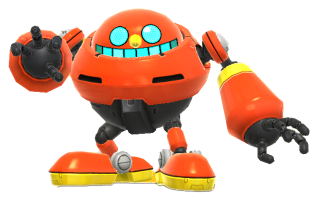 In Sonic '06, Robotnik's model of choice shifted to the more combat-orientated Egg Gunner (itself apparently based on the E-2000), while in Sonic Unleashed, Egg Fighters became the generic template for an Eggman mech. Greeter Egg Pawns - These Egg Pawns dawn welcome signs which they use to hit Sonic with if he gets too close. They appear in Tropical Resort. Chef Egg Pawns - These Egg Pawns have a chef's hat and a wooden spoon to strike the blue blur. They reside in Sweet Mountain. Parade Egg Pawns - These Egg Pawns are in conductor outfits with a trumpet to blast Sonic with. They are in the Starlight Carnival. Construction Egg Pawns - These Pawns have construction helmets and pick axes to swing at Sonic. They work on Planet Wisp, and they return for the same stage in Sonic Generations with the same attack pattern. Samurai Egg Pawns - These pawns have full on samurai gear, complete with a katana to slice Sonic. They live in Aquarium Park. Ogre Egg Pawns - These Egg Pawns are built for battle with armor and a accompanying mace to hurt Sonic. They survive in the Asteroid Coaster. This page was last edited on 12 October 2018, at 18:47.